Our roving food critic Terrance Mc Arthur continues his search for great food in Sanger and the surrounding communities. Check out more Great Food Search here! Due to some computer issues, this column is a week later, but hey better late than never. 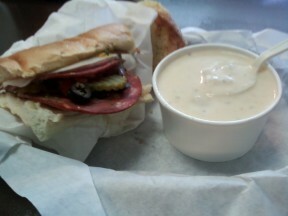 If the Clam Chowder from the Reedley Sandwich Shop appears pink or orange, do not adjust your monitor. Reedley Sandwich Shop (Reedley)–While in search of great soups, I was repeatedly told to go to the Reedley Sandwich Shop. I love their daily clam chowder and the sandwiches. Most restaurants only serve chowder on Fridays, but the RSS has stimulating chowder every day. Spices that impart a “pinkness” to the soup give it a wake-up quality that gives you energy for the rest of the day. I usually order the soup and half-sandwich, and those “halfsies” are packed with more than you would find in many whole sandwiches: tender meat, crisp greens, and yummy sauces. The Reedley Sandwich Shop is my favorite part of days when my work takes me to Reedley. 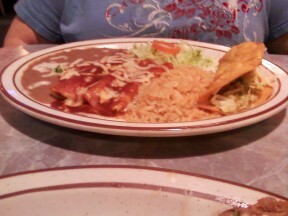 You got your Cheese Enchilada, your Chicken Enchilada, and your Shredded Beef Taco...RIGHT HERE! La Haciendita (Sanger)–When La Haciendita took over the building that had housed Perko’s, Austin’s, and The Ranch House, I wasn’t sure about trying it, but I went…and went…and went. The sopes were a new experience that quickly became a family favorite. The place serves good, solid, Mexican fare, and plenty of it. If you like to watch sports, there are several TV screens overhead, but the room’s noise level stays pretty reasonable. It’s a family environment that doesn’t get dysfunctional. 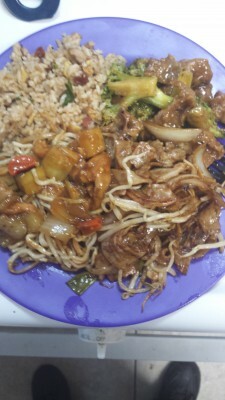 Good stuff from China Garden (Chow Fun in the lower right). China Garden (Orange Cove)–I never thought I’d look forward to going to Orange Cove, but that was before people started talking to me about the China Garden. It doesn’t look exciting, but I found Chow Fun, which is a rice noodle dish. Since then, I have located Chow Fun on other menus, but this is the only one that mixes wide and narrow rice noodles. Remember—bring cash. Spike N Rail (Selma)–I have always had a fondness for Pea Soup Anderson’s, back to the days when my mother would take us to Solvang and talk Danish to people at the bakery. When Selma’s branch turned into the Spike N Rail, I wrote it off my list. Now, it’s back on my list, with stars and bullets. The pea soup is worthy of its sire, and there were frikadeller (multi-meat patties that weren’t like mother used to make, but oh-so-good!). I’m crazy about their applesauce-cured red cabbage. Yummmmmm-y! Go there! Red Caboose Café (East of Clovis, North of Sanger)–On a night when I couldn’t go where I wanted to go, we found ourselves in the vicinity of nowhere, at the corner of Shaw and Academy, at The Red Caboose Café, and I am glad. I found down-home cooking that was beyond home cooking, and the breakfasts are so good that they have to keep a mammoth pot of gravy on the stove to smother the super-puffy biscuits. 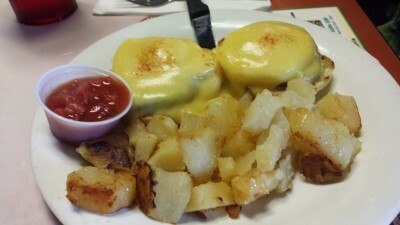 Eggs Benedict at The Red Caboose Café. Those are my five top picks, but I want to give a special mention to the DiCicco’s in Sanger. They have re-imagined their menu and created some fantastic new dishes, while keeping the core foods that the Valley loves. What lies ahead for the Great Food Search? We’ll keep looking, keep searching, seeking out great places to eat and interesting themes to explore. You can be part of that search. Suggest new dishes to compare, new restaurants to try, and the Great Food Search will continue. Check out more food articles and more of Terrance’s Great Food Search column in our Food Fun section. Thank you for this recognition. It is a privilege to be recognized by your publication in this fashion.